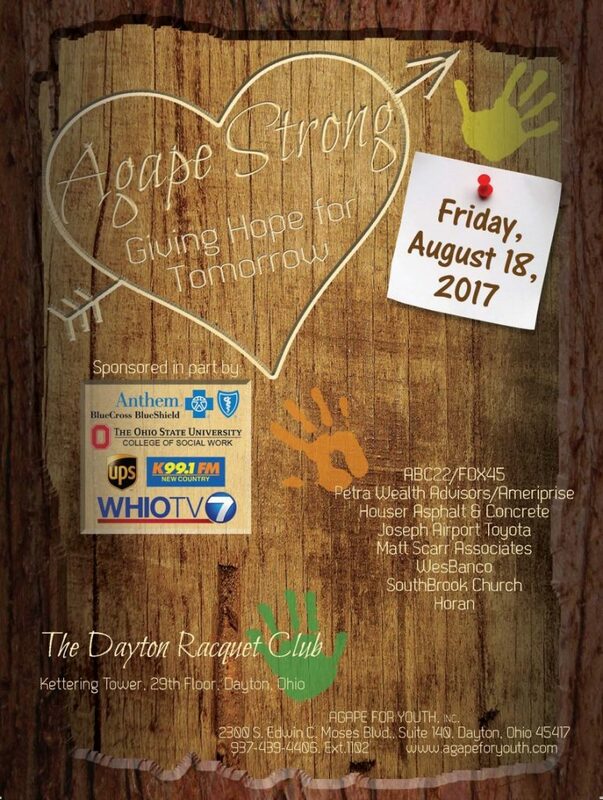 Giving Hope for Tomorrow - Agape for Youth, Inc.
To begin, I want to extend my sincere thank you to all those who attended the ‘Agape Strong-Giving Hope for Tomorrow’ Gala and to all of you who continue to support our Agency. Friday evening reminded me that even as we always strive for excellence, perfection is just not possible. Yet, in being the over achievers we are, we have already begun the process of how to make next year’s Gala even better than the last! A regret I had after the Gala was I did not take the opportunity to share present and future planning for Agape. I allowed “time” to lead me to cut my presentation short. Based on feedback and encouragement I have received since the Gala, I wanted to share with each of you what I had prepared. “Welcome to this evenings ‘Agape Strong-Giving Hope for Tomorrow’ Gala. I would like to first recognize Montgomery County Commissioner Debbie Lieberman and Montgomery County Commissioner Judy Dodge. Also joining us this evening is State Representative Jeff Rezabek and State Representative Niraj Antani. I would also like to recognize Sandra Brassington, Liaison for Governor John R. Kasich and Dean Tom Gregoire of The Ohio State University College of Social Work. All have significantly supported Agape’s mission of serving. To my Co-workers, Agape’s Leadership team, our Board of Directors, and our foster, adoptive, and reunification families thank you for your dedication to Agape. I especially want to thank the youth and families we serve for both allowing us and trusting us to serve them. To our Sponsors and Donor’s whose generosity has made tonight already a success, words cannot express how thankful I am to and for you. To Sandie Geib, our Director of Development and Marketing, you and your team of Agape co-workers, Board members and community volunteers have done an amazing job in bringing tonight together. Most all the activities and programs at Agape are in part supported through our Youth and Family Fund. We recognize and embrace that just as we are entrusted with the youth and families to serve, we are entrusted with the monies from your generosity and remain dedicated to being a good steward of them. As an Agency, we set specific goals when we moved into our new offices two years ago. They included offering a visitation site to referring agencies (both inside and outside) and to establish a community tutorial model where youth can come and receive monthly individualized tutoring services. We have also initiated a book reimbursement stipend to our youth that are furthering their education. With our added space, we have expanded the training opportunities to families; including foster, reunification, and families in our community. We continue to offer these trainings county wide at no cost to the participants. Further, we expanded upon the opportunities to serve our community through creating a greater visibility of our Community Blessing outreach and offering our site for community meetings. In addition, our expansion to Cincinnati has been doing great things for the Cincinnati community. Agape’s future initiative with UPS will provide opportunities to youth, young adults and families that could truly add to them being given “hope for tomorrow”. We are honored to have been selected by UPS for this opportunity. In the coming months Agape will be developing and implementing Independent Living opportunities for youth to help them to realize that success is in fact truly theirs for the embracing. When Agape began our services in 1989, it was quite a celebration when we licensed our first family, who are here with us tonight. Please join me in recognizing the first family licensed with Agape, Clifford and Lauretta Phillips who after 28 years remain dedicated both as a foster family with Agape and adoptive parents of two. Finally, there was a miscommunication and we failed to recognize one of our Donors. On behalf of Agape, I’d like to publicly thank Terry Huber for her generosity both as a Donor and Supporter of Agape. While it’s already been said, your generous support of Agape at any level furthers our ability to serve with excellence those entrusted to our care. I heard it said recently that “the purpose of work is to discover what you love”. I thank God for blessing me with a love for doing what I do and for blessing me to be able to live out Agape’s mission of serving youth and families with such a great group of co-worker’s, friends, and community. As a service to our Licensed Foster Parents, we have provided a list of specific required documentation forms. Copyright © 2019 · All Rights Reserved · Agape for Youth, Inc.